Bovine Coronary Artery Endothelial Cells (BCAEC) from CAI have been used to demonstrate that stress hormone cortisol inhibits NO synthase and Ca2+ mobilization, leading to decreased NO release by endothelial cells, resulting in increased arterial contraction and decreased blood flow. A Similar action mechanism was determined for cocaine effects on arteries. Additionally, it was found that cocaine-induced apoptosis of endothelial cells is mediated by attenuation of NO production, down-regulation of Bcl-2 and translocation of Bac to the mitochondria, followed by release of cytochrome c and activation of caspase 9 and caspase 3. BCAEC were also used to determine diabetes-related vascular dysfunction. Others employed the cells to evaluate novel mesh-like materials for their suitability for biomedical applications. (Click to Enlarge) Bovine Coronary Artery Endothelial Cells: BCAEC. Isolated from blood vessel tissue. Moreno-Ulload, A., D. Mendez-Luna, E. Beltran-Partida, C. Castillo, G. Guevara, I. Ramirez-Sanchez, J. Correa-Basurto, G. Ceballos, and F. Villarreal. 2015. 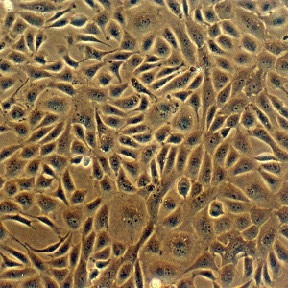 The effects of (−)-epicatechin on endothelial cells involve the G protein-coupled estrogen receptor (GPER). Pharmacological Research, doi:10.1016/j.phrs.2015.08.014. Takizawa, Y., R. Nakata, K. Fukuhara, H. Yamashita, H. Kubodera and H. Inoue. 2015. The 4-Hydroxyl Group of Resveratrol Is Functionally Important for Direct Activation of PPARa. PLoS ONE 10(3): e0120865. Varela, C., E. Fromentin, M. Roller, F. Villarreal, and I. Ramirez-Sanchez. 2015. Effects of a Natural Extract of Aronia melanocarpa Berry on Endothelial Cell Nitric Oxide Production. J Food Biochem, doi: 10.1111/jfbc.12226. Romero, M.J., D.H. Platt, H.E. Tawfik, M. Labazi, A.B. El-Remessy, M. Bartoli, R.B. Caldwell, and R.W. Caldwell. 2008. Diabetes-induced Coronary Vascular Dysfunction Involves Increased Arginase Activity. Circulation research. 102:95-102. Niwa, K., J. Sakai, T. Watanabe, T. Ohyama, and T. Karino. 2007. Improved arterial wall model by coculturing vascular endothelial and smooth muscle cells. In vitro cellular & developmental biology. Animal. 43:17-20. He, J., S. Yang, and L. Zhang. 2005. Effects of Cocaine on Nitric Oxide Production in Bovine Coronary Artery Endothelial Cells. Journal of Pharmacology and Experimental Therapeutics. 314:980-986. Nair, L.S., S. Bhattacharyya, J.D. Bender, Y.E. Greish, P.W. Brown, H.R. Allcock, and C.T. Laurencin. 2004. Fabrication and Optimization of Methylphenoxy Substituted Polyphosphazene Nanofibers for Biomedical Applications. Biomacromolecules. 5:2212-2220. Rogers, K.M., C.A. Bonar, J.L. Estrella, and S. Yang. 2002. Inhibitory effect of glucocorticoid on coronary artery endothelial function. American Journal of Physiology - Heart and Circulatory Physiology. 283:H1922-H1928. He, J., Y. Xiao, and L. Zhang. 2001. Cocaine-Mediated Apoptosis in Bovine Coronary Artery Endothelial Cells: Role of Nitric Oxide. Journal of Pharmacology and Experimental Therapeutics. 298:180-187. He, J., Y. Xiao, C.A. Casiano, and L. Zhang. 2000. Role of Mitochondrial Cytochrome c in Cocaine-Induced Apoptosis in Coronary Artery Endothelial Cells. Journal of Pharmacology and Experimental Therapeutics. 295:896-903.